Annual plant. Stems several or numerous, 15.0 - 30.0 (40.0) cm tall, erect or only at the base ascending, usually at the top of highly branched, short moderately fibrous fitting, at the bottom of almost naked. Prilistnitsi equal to the petiole, longer or slightly shorter than them. Lower leaves linear lanceolate, ovoid lantsetni above, all at the base non-extended, without ears, with protruding veins, entire, long pointed, tunicates, green. The leaves with identical or naked stems, above consistent. Leaflets (7.0) 15.0 - 18.0 (22.0) mm long and (3.0) 6.0 - 8.0 (10.0) mm wide, all half edge finely serrated, the top slightly concave or rounded, those of upper leaves narrowly ovate to elliptic back to close rhombic, lower broader back ovate to ovate rhombic with 12 - 20 straight side stripped bare all or dispersed, most often on the edge fibrous , sessile. Stems inflorescences equal in clusters leaf or longer, fibrous. Heads 15.0 - 18.0 (20.0) mm long, spherical or ovoid short, loose or relatively tight, numerous, lying top or axillary. Bracts presented by a few, short red glands. Flower stalks shorter than 1.0 mm, from the tube of a calyx or equal to it, short fibrous fitting, sometimes almost sessile flowers. Flowers 25 - 40, 6.0 - 7.5 mm long, semi-erect. Calyx 2.5 - 3.5 mm long, goals, 5 clearly protruding veins, tube bell-shaped, bilabial, throat free; bare teeth or fibrous, linear upper wedge, lower linear styliform, 2 - 3 (4) times longer than the upper and 1 - 3 times longer than the lower lip of the calyx, naked or fibrous. Corolla golden yellow in overblown brown buffy, 1.5 - 2 times longer than the calyx. Flag 5.5 - 6.0 mm long, with keel, back ovoid, strongly ribbed at the base gradually narrowing in the small claw, at the top concave, 2 times longer than the wings and keel. Wings with wide incorrectly elliptical leaf blade and widely, up to 2 times shorter than its filamentary tongue equal to the keel or slightly shorter. Keel sickle elliptical, leaf blade elliptical, equal stranded claw, beans elliptical egg-shaped, monocotyledon equal to calyx. var. aureum. T. agrarium var. pallidium Sef. et. D. Jord. Lower teeth of the calyx1 - 2 times longer than the lower lip of the calyx, naked. distributed within the species. var. achtarovii (Urum.) Kož., st. n .; T. aureum subsp. achtarovii Urum., Mag. Bot. Lap. 1 (12) (1927) 4; T. aureum f. achtarovii (Urum.) Stoj. Stef. Kitan., Fluoro. Bul. Ed. 4, II (1967) 602. The lower teeth calyx 2 - 3 times longer than the lower lip of the calyx, fibrous. Central Stara Planina (Balkan mountain), Rhodopes. Economic importance. Very good fodder plant. 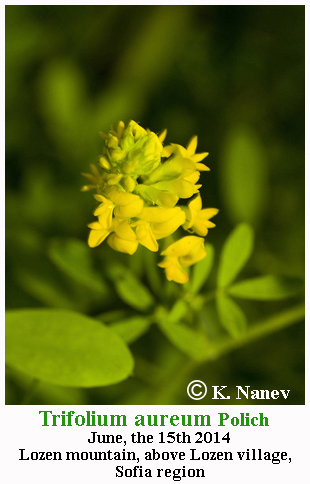 Trifolium aureum, known by the various common names large hop trefoil, large trefoil, large hop clover, golden clover or Hop clover, is a species of clover native to much of Eurasia. 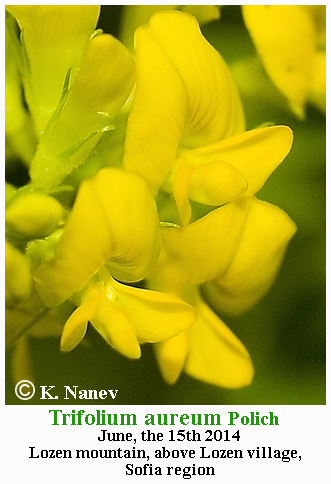 Large hop trefoil is a small erect herbaceous biennial plant growing to 10–30 cm tall. Like all clovers, it has leaves divided into three sessile leaflets, each leaflet 15–25 mm long and 6–9 mm broad. Its yellow flowers are arranged into small, elongated round inflorescences 12–20 mm diameter, located at the end of the stem. Each individual flower is decumbent. As they age, the flowers become brown and paper-like. The fruit is a pod usually containing two seeds. 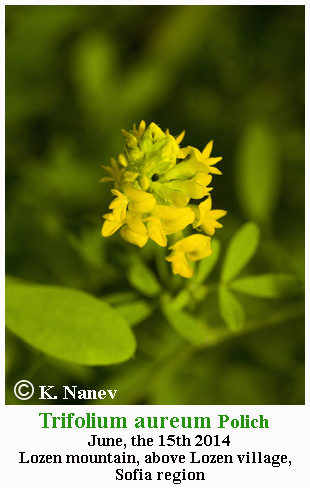 The closely related Trifolium campestre (hop trefoil) is a similar, but shorter, spreading, species with smaller leaves and flowers. The middle leaflet of its leaves also has a short rachis. Flowering Time: Blooms: VI - VII, fruitful: VII - VIII. Distribution in Bulgaria: Grows in the meadows, glades and thickets in mountainous zone. Common except Black Sea coast, northeastern Bulgaria, Eastern Balkan, mountain, Tundzha hilly plain and Strandzha to 2200 m altitude. Points for Northeastern Bulgaria (Kov., 1903) and Eastern Stara Planina (Urum., 1909). (Conspectus of the Bulgarian Vascular Flora) = conspectus&gs_l= Zlc. Distribution: Europe (except for the extreme north and west), the Caucasus, Southwest Asia (Asia Minor), Western Siberia, North Africa. In eastern Siberia transferred.